Number One: Bertha Bag 2.0 is progressing nicely! It's been knit, fulled, fulled again, fulled some more, cut, pieced, sewn and now embroidered upon, all by me. If all goes well (and I don't get distracted,) tonight she's getting a button and handles. Then it's off to my Etsy shop with her! This series of bags (of which there is another on the way soon,) is, of course, named after Bertha. 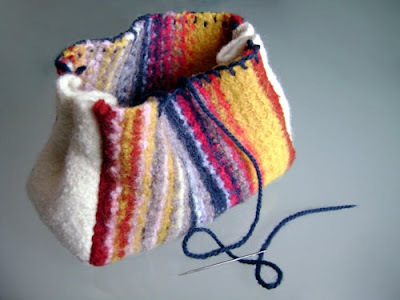 When I made the original bag a milion years ago (or January 2006, whichever you prefer,) she liked it enough to snap it up when it first went on sale. I really hope she doesn't mind that I've named my bags after her! Here's the original bag, since it was never posted about on this blog: Total serendipity, that. I only had a rough idea of what I was going to end up with when I made that one. Now, I have a little more experience with the making and construction of the bags, but it's still a pretty random process. Number Two: I cast on today for my first sweater EVER, the Central Park Hoodie. 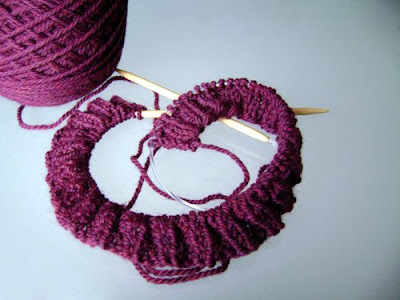 There's not too much to see just yet, but that's enough evidence for me that I'm actually knitting a sweater. I am in love with this pattern and have been for quite some time. Here's hoping that it goes well! I love the colour of the CPH!! And the Bertha bag looks amazing! I can't believe you turned the funny looking swatch into that. February 15, 2009 at 6:01 p.m. 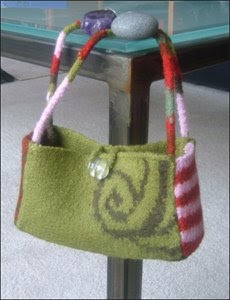 The bag is really lovely & I love felted bags. Nice color for your CPH. February 15, 2009 at 6:28 p.m.
Congrats on your first sweater (the colour is great) although given the mittens and socks you knit it should be a no brainer! Enjoy it! February 15, 2009 at 6:58 p.m.
Hee hee! I am HONORED to have a series of bags named after me! I rarely get to use the original anymore as June has proclaimed it her own. She carries a tube of chapstick, some pennies, a doll brush, and a my little pony around in it. 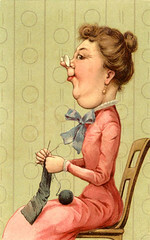 February 15, 2009 at 9:48 p.m.
February 16, 2009 at 1:00 p.m.
Free sock pattern -- this week only! Can it be? WIP Wednesday!